Paternoster Square has seen a good deal of investment over the last few years, this has raised it's profile as a distinct area of the City, the London Stock Exchange relocated here with brand new headquarters in 2004. 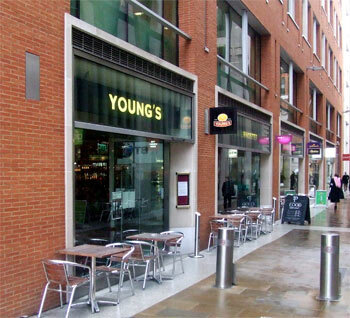 Young's have taken this opportunity to open The Paternoster and a pretty decent job they've made of it too. The Paternoster is a stones throw from St. Paul's Cathedral and there is an excellent photo to be taken looking back down the street. Opened by the Lord Mayor Alderman Robert Finch in 2004 this brand new building has a modern glass frontage but The Paternoster keeps to a traditional English pub style, there are plenty of varied seating and the bar is well stocked with Young's excellently kept beers, which of course includes Wells Bombardier. The food is reasonably priced for a City pub and I can recommend the Thai Green curry, but you need to be lucky because it's on the specials board only now and then.